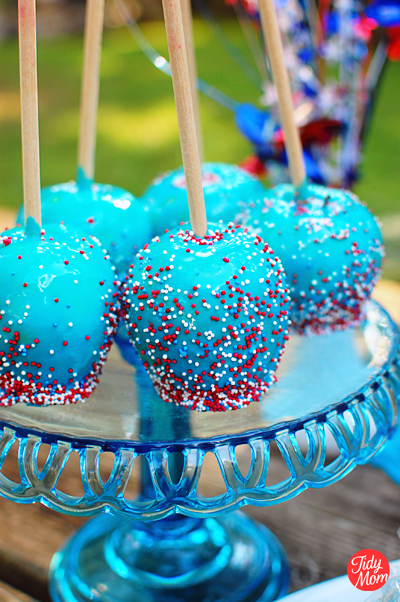 A layer of chewy blue raspberry candy coats a crisp, tart apple in this old-fashioned favorite, Red White & Blue Candy Apples. If you follow me on twitter or facebook, you probably saw all my hints and teases all weekend about “what am I making”. I don’t remember how it happened really, but one day while stumbling around on the internet I ran into Blue Raspberry Candy Apple Magic Mix. 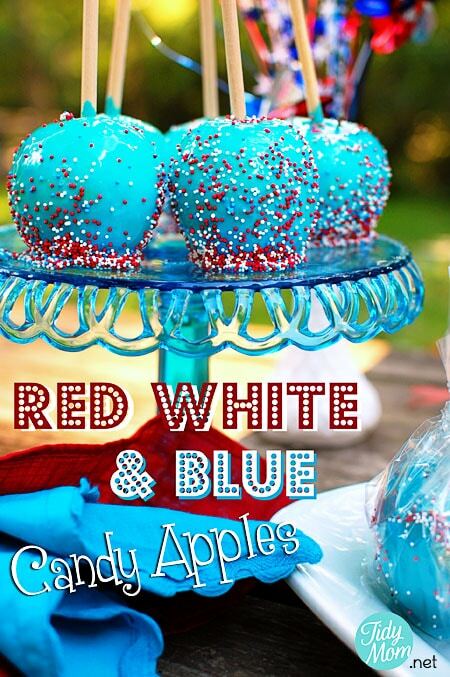 The instant I saw it I knew I had to make some Red White and Blue Candy Apples for 4th of July! I’m a big fan of caramel apples and candy apples. Most of the time I only get them in the fall when I see those cute little Happy Apples all over my grocery store. 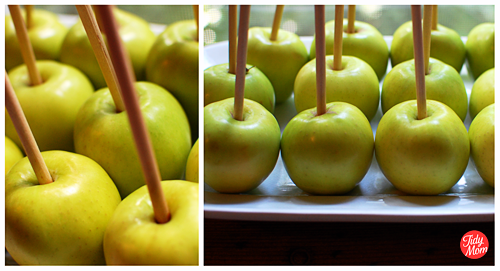 I’ve never made candy apples before, I thought how hard could it be! HA!……well, let me tell you, it’s NOT hard if you have the correct directions and a little information. My first attempt was failure. I hung my head as tears rolled down my cheeks. My apples LOOKED pretty. They looked as good as I had envisioned. Only one problem………the candy coating was ROCK hard! like a sucker! You couldn’t even cut it with a knife, much less bite in with your teeth. So I crawled in to bed defeated, I tossed and turned all night, wondering why my apples didn’t turn out….was the “magic” that it turns your apple to a sucker? 🙁 couldn’t be. Day 2 I got up determined to give it another try. After speaking to my friend Cindy, I discovered the package directions suggest heating your candy mixture to 300°, will yield candy like a sucker. She suggested I try 250°. …………..and guess what?! THAT was it!!!! I had a nice caramel/taffy consistency on my apples! Apples – I used Granny Smith, but any firm tart apple will work. one bag of Candy Apple Magic can coat up to 100 apples – so I only used 1/2 of the package. Place on lined & greased pan and continue with rest of the apples. Once your apples have cooled, you can eat and enjoy! Make sure to eat them within three days of making them, and I would recommend storing in the refrigerator. We left ours out over night in the air conditioned house and they melted quite a bit. If you’d like to give some as gifts or party favors, cover in cellophane and tie off with a pretty ribbon or red twisty tie. I just LOVE the way they turned out! and they were every bit as chewy and delicious as I had anticipated!! I’m glad I gave them a second chance!! I think these would be adorable for a 4th of July celebration!! Awesome job! They look bluelicious! I’d love for you to share this at my link party… I am doing a post about red, white and blue treats and this would be perfect! I just want to let you know that you just got a STICKER from me at The 36th AVENUE… Thank you for sharing! This is a wonderful idea. You did a great job. So nice, I would be afraid to eat it! Hi there! I absolutely love your adorable apples! Just wanted you to know I featured you! Check it out! Thanks for the awesome idea! I love these! 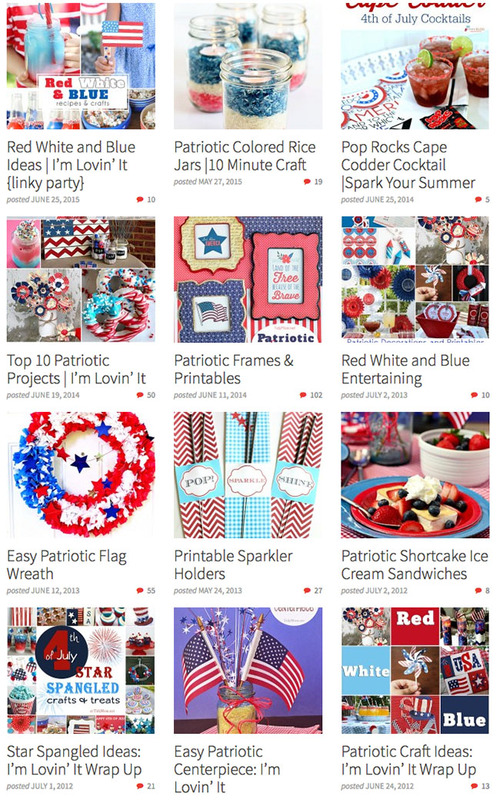 I’m having a Red, White and Blue Linky Party today and I’d love for you to come join in on the fun! These are great! Where did you get that beautiful blue cake plate from? These look SO good. Thanks for sharing your experiences and a great tutorial! 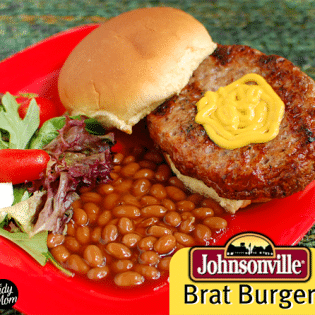 Stopping by to let you know that this recipe has been featured in my Patriotic Round-up of recipes and craft ideas. Hi, Cheryl! 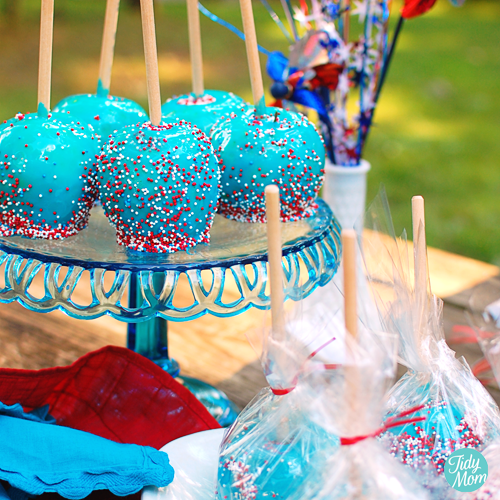 Your Candy Apples have always been one of my favorite pins in my ☆- Happy Birthday America! -☆ pinboard, so I couldn’t resist sharing them with my readers on my blog today! I would love for you to share and link up at my weekly TGIF Link Party if you haven’t already this week. Your favorite posts, most popular, recent or new! The party is open every Thursday night and closes Wednesday’s at midnight. 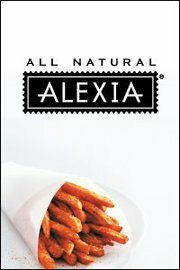 Followed by (Not SO) Wordless Wednesday! . I would be honored if you join us! Have a wonderful week! I am a bit frustrated that American ‘recipes’ invariably contain some odd ‘ingredient’ that isn’t available anywhere else in the world. Do you guys cook things from scratch with normal ingredients ever? I wanted a bright blue candy coating and saw a mix online – my post is simply to share what I’m making. You can always make the candy coating with corn syrup and sugar and lots of food coloring. How many apples did half a bag coat? How did you come up with your measurements? I didn’t come up with measurements, they are one the bag. I also stated that one bag of Candy Apple Magic can coat up to 100 apples.